February 22 - Poetry For Prizes! Today was Poetry for Prizes, our first one since the triumphant performance at the talent show. I've had the kids working on learning how to recite "La Di Da Di" by Slick Rick and Doug E. Fresh for the past year, giving them prizes (usually Justice League Unlimited action figures I get off eBay for about $5/figure) every time they were able to memorize a section. It was a process, but the positive motivation of being able to get a toy made them really want to learn, and with practice and repetition they were able to get their parts down. This is helping them develop in SO many ways. First of all, it's challenging. The most important lesson I want to teach my kids, the thing we tell them everyday before we drop them off for school, is "If things are hard, what are you going to do? Try harder." There are lots of times when they mess something up and I correct them that they think it's too hard and want to give up. You definitely have to work with them through that. But if they learn that by trying they can improve themselves, that's an invaluable lesson to provide your kids. Immediately after stopping, I said "It's 'slammed the child on the hard concrete', but really great otherwise!" But I was so proud of them inside. Two things to check out: Look at Lyric's fresh delivery, really emoting there at the end. And check how Zephyr is bobbing to the beat... that's some real progress being made, he's starting to feel the rhythm. This is why I'm doing all of this, and where being a dad becomes really fun. Also as a note of explanation: Zephyr is wearing his paint splatter T-shirt because he has art on Mondays, and Lyric is wearing his clothes backwards because he is an extremely silly little boy. 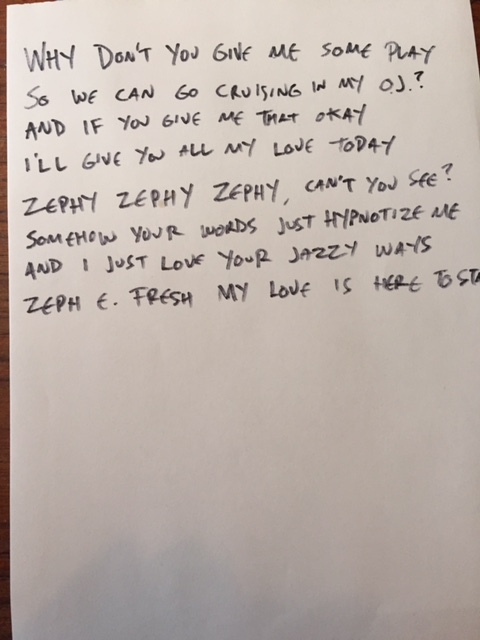 Here's the lyrics I wrote out this morning to help Zephyr learn his lines. I had to modify a few words to make it right, but I figured if Snoop can do it, there's legal precedent. Zephyr was still working on it as we went to school, but he got a fresh new red ukulele (that I picked up at the recent Toy Fair for cheap, but you don't need to know that) for the hard work he put in. Lyric will definitely get a prize too once he gets his new song down. Next stanza coming soon... the end goal here is to create a video of them doing the whole thing. Stay tuned. Doug E. Fresh, please say you'll work for spec.